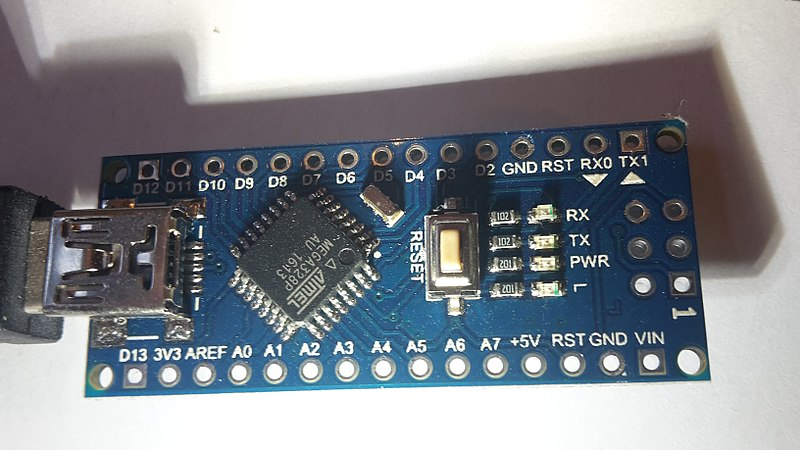 I wrote some code for the ATmega328P, (Packaged in a module that clones the Arduino Nano). Normally when I send UART data from my computer to these micros, it is received just fine. However I have started a new project and I am getting intermittent characters missing from the beginning of a message. The code I wrote thus far reads the incoming data and prints it back to the computer. I am trying to send "<A2>". Something like 80% of the messages are received and printed back fine. The rest are missing characters. Oddly, they are at the beginning of the message, giving me "A2>" or "2>"
I am using a baud of 115200, though 9600 and even 600 appear to give the same ratio of bad messages. I tried swapping the micro and there was no change. I'm only sending messages once every 5 seconds or so. The micro is being powered from the same USB cable going to the laptop that the data is sent over. Below are oscilloscope/logic analyzer captures of two signals, one that worked fine and another that was missing characters. The probe is placed right at the "RX" pin and grounded right at "GND". Those two signals look awfully close. Update: As user duskwuff mentioned, the UART signals are actually not approaching 0V for LOW. I tried using nothing but the bare module itself (no protoboard, nothing), but I'm getting the same results. To further diagnose, I tried manually writing to the RX pin. That makes the signal swing properly down to 0V. 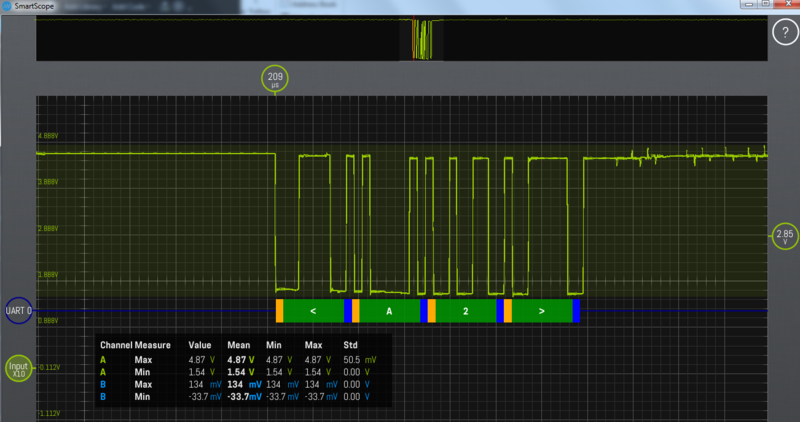 Watching the RX line during code flash, the LOW is also about 1.5V. Now I'm extra confused. How can I get the same result with multiple bare-modules, even brand-name ones? That makes me lean toward blaming software. The purpose of my this code is to create a sort of protocol for received messages that processes them one at a time, even if multiples are sent all at once ("<A1><A2><A3>...") or if they are sent in only partial pieces ("<A" and then "2>"). There is a flaw in your handling of your serialCommand_msgPending flag. Serial.available() returns non-zero and serialCommand_msgPending is false, so first block is now executed, re-initialising your buffer and setting serialCommand_mgsPending to true. Subsequently, the while loop in serialPreParse() will receive the rest of the message, however you've lost the first byte(s) because they are overwritten by the subsequent bytes. What jumps out to me here is the mark (low signal) levels in your UART signal. 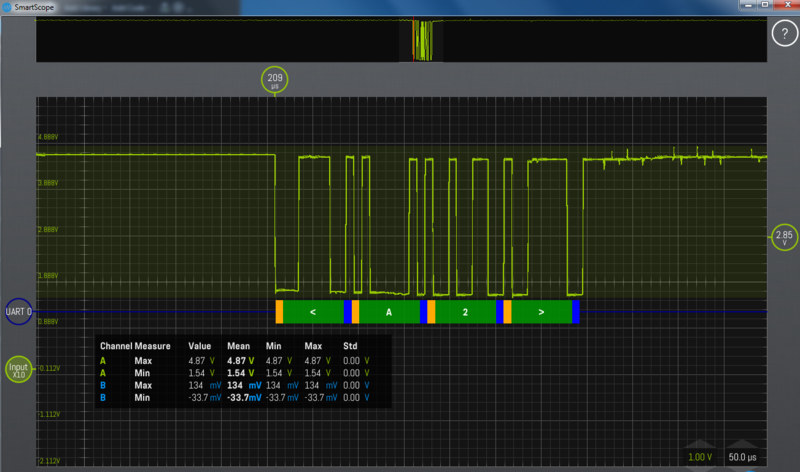 Marks should be close to zero, but the oscilloscope output you've included looks like it's only dropping to ~1.6V, especially on the first few characters. This is well above VIL for your microcontroller (0.2×VCC = 1V), so the microcontroller will not reliably interpret it as a logical low. What hardware are you using to generate UART output from the computer? Make sure it shares a ground with the computer. If this doesn't help, it may be faulty and need to be replaced. Lets assume that electrically everything is good and maybe your scope's ground was poorly connected. Can you try this as a test and see if it gives you the result you want ( I don't have an Arduino to test). Basically, it looks like there maybe a race condition in your code between where you are resetting the state of your preparser and where you are actually reading data. You can get into a state where you check if serial data is available in the reset code and its not, then you move on to the reading where there may now be data available. In this condition the reset code did not execute so your index and other variables are not reset correctly. This code simplifies the retrieving of the command just for a test so see if the software is the issue. It will call serialGetCommand and block until a '>' char is received. Once it is it will return with what was sent before the '>' in the serialCommandstr buffer which can then be checked. It seems like this is what you were trying to accomplish but I may be wrong. Do you have external pull resistors on the RX line (including pulls that might be enabled in the USB to UART chip)? If so make sure you don't have the internal pull resistors enabled in ATMega (Write 0 to the appropriate bit in the appropriate PORT register). Not the answer you're looking for? Browse other questions tagged microcontroller atmega serial uart c++ or ask your own question. How should I interpret this USB packet in a human readable way?